Are you bringing a new kitten home you your condo or house? Will you want to start training them right away, so they aren’t going to scratch and claw your furniture? If so, you need to make sure that you have a good scratching post. 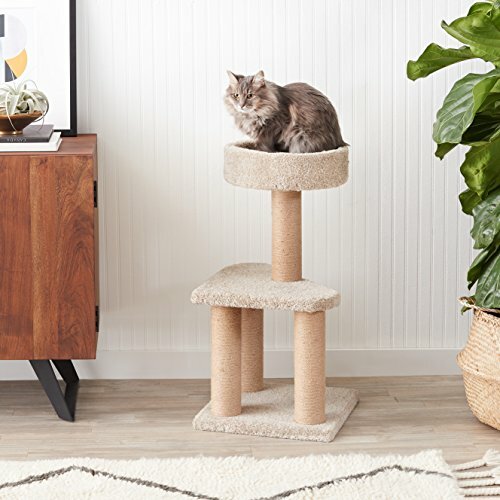 There are many different types available, but you should be looking for one that is more than just a scratching post, such as the AmazonBasics Cat Activity Tree with Scratching Posts. This is a place where they can sharpen their claws, stretch, play, and curl up for a nap, and it is all theirs. 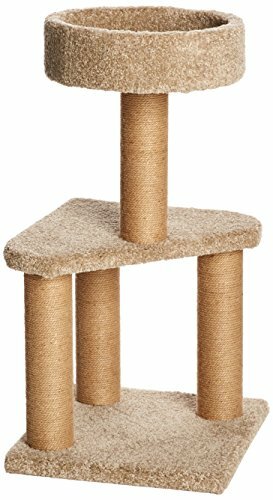 This scratching post is an activity center for your cat, as well as a comfortable place for them to have a nap. 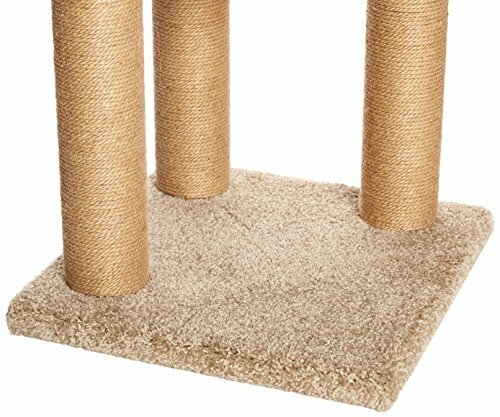 It has two platforms, and three scratching posts that are wrapped in jute, so they are going to hold up to a lot of scratching. 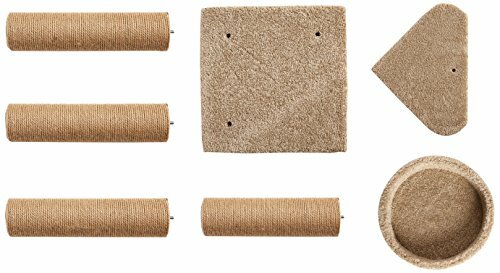 This scratching post is made from a variety of materials, including MDF, carpeting, paper/cardboard tubes, and jute. The stand is constructed from compressed wood, and the surfaces are carpeted, so your cat will have a comfortable place to rest after playing on this activity center. This is a stable unit, thanks to the large, square-shaped base. It is even safe for two to three cats to play or sleep on it together. The platform at the top is rounded, and it has a curved rim to make it even more comfortable, and it makes a terrific cat bed, with plenty of space to curl up or stretch out. There are three areas for your cat to scratch that are wrapped in jute rope, which is going to stand up to a lot of abuse from one or more cats. Your cat isn’t going to get bored scratching at the same old post all the time, because there are a few to choose from. The jute is better for scratching than carpeting, as their claws can get snagged on the carpet (but it is perfect for the bed are at the top). This cat activity tree is easy to put together, and all of the hardware and tools you need are included with your purchase. It has a screw-together assembly, so it should only take a few minutes to assemble the entire unit. Once assembled, this unit is large enough to accommodate more than one cat but small enough to easily fit into most rooms. There are certain features to look for when choosing the best scratching post for your cat, and it should be able to accommodate your cat’s needs as well as your own (space, design, color, etc.). A scratching post should be tall enough to allow your cat to get a full scratch while sharpening their claws. It should have both horizontal and vertical scratching surfaces, and it should have a place where your cat can rest or perch. It should be sturdy enough to not topple over when a cat jumps onto it, and it should be a place where your cat can both play and rest. 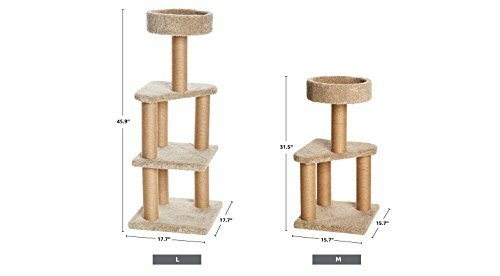 The AmazonBasics Cat Activity Tree with Scratching Posts meets all of these requirements and is a multi-purpose cat furniture product. You don’t need to use any special tools to assemble this scratching post, other than a hex key wrench, which is included with your purchase. Just make sure that you read the instructions in order to assemble it quickly with no mistakes. Once you have assembled the scratching post properly, it is a sturdy unit that cats will love to scratch, as well as jump on and play on. It can also be used as a cat bed, with the round section being perfect for cats that like to feel snug and secure. Because this is a three-tiered scratching post, it is going to be tall enough at the highest part for even larger cats to be able to get a good stretch while they are sharpening and trimming their claws. This is a unit that is large enough for bigger cats, but it isn’t going to take up a lot of space in your home. It is beige in color, so it is going to fit in with most color schemes and should look good in any room. This unit can sometimes have a tendency to wobble, and it may not be as sturdy as necessary, especially for larger cats. They may not be able to jump onto the top section without knocking the unit over. After receiving your order, check to make sure that all of the parts have been included. Due to shipping and handling errors, there may be instances where some parts are missing, such as the Allen wrench that is needed for assembly. There may be some problems assembling this scratching post. In some cases, not all of the screw holes have lined up, making the poles lean and be less sturdy than they should be. If any pieces are broken, contact customer service. You have your own furniture, so why shouldn’t your cat have their own furniture as well? Having their own post that they can scratch on to their heart’s content is going to save you a lot of money in the long run, because you won’t have to replace furniture that they have destroyed with their claws. 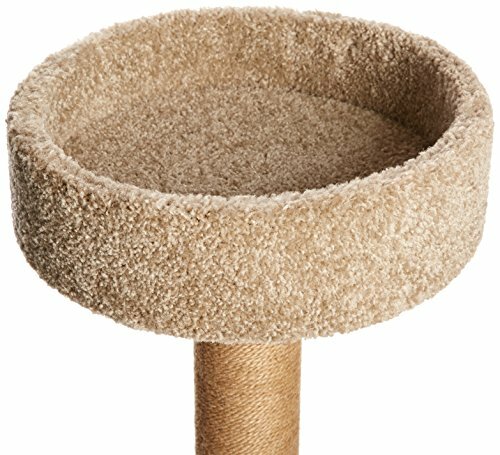 Getting a scratching post such as the AmazonBasics Cat Activity Tree with Scratching Posts is great because it has a lot to keep them occupied, from something to scratch on to a toy to play with to a comfortable bed to sleep in. This is more than just a scratching post. It is a toy, a scratching post, and a piece of furniture for your cat.